This May 31, 2018 file photo shows the reduced water level of Lake Mead behind Hoover Dam in Arizona. California and Arizona have missed a federal deadline for seven Western states to wrap up work on a plan to ensure the drought-stricken Colorado River can deliver water to millions of people who depend on it. Without a consensus among the states, the agency will allow governors from the seven states to weigh in with recommendations on what to do next. The federal government also could step in and impose its own rules in the river's lower basin, affecting California, Arizona and Nevada. U.S. officials project each August whether Lake Mead can deliver a full amount of water to Arizona, California and Nevada. Right now, there's a more than 50 percent chance of a first-time shortage in 2020. 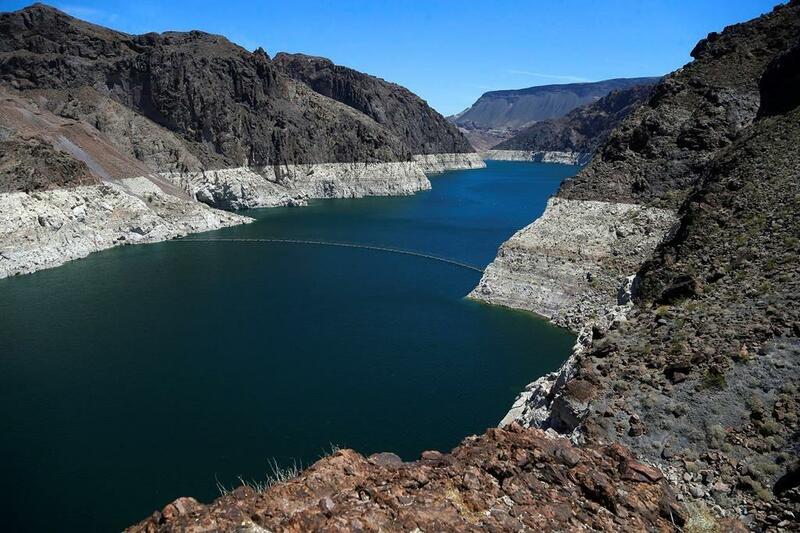 If there's a shortage, Nevada and Arizona would face the first round of water cuts. California would never lose any Colorado River water because it has the most senior rights. Under the drought plan, Arizona, Nevada and California voluntarily give up water from 2020 until 2026. The cuts won't prevent people from turning on their faucets at home. Much of the water will be stored behind Lake Mead to keep it from falling so low that it can't deliver water at all. The Bureau of Reclamation is the delegated "water master" of the Colorado River's lower basin under a 1928 law that created Hoover Dam, which holds back Lake Mead. That means agency Commissioner Brenda Burman can step in if the states don't work out a plan on their own. Her authority is broad and unspecified. Most water users believe any action she would take that's not in line with the negotiated drought plan would prompt lengthy, legal challenges. "It's much cleaner and much more appropriate to implement a set of plans that have been negotiated by the states and endorsed by a number of constituencies outside the states themselves, that have a general level of consensus," former agency Commissioner Mike Connor said. Most states aren't planning to submit recommendations to the Bureau of Reclamation right away and likely will incorporate some aspects of the drought plan in their comments. "If the DCP is put into effect and you actually get experience with implementing some of those larger cuts, I think that teaches you a lot about what the realities are about living with less supply than perhaps we all have become accustomed to," former Reclamation Commissioner Estevan Lopez said. A new study from Northern Arizona University shows the area burned by wildfires in Arizona and New Mexico has increased by about twenty thousand acres annually since the mid-eighties. KNAU’s Melissa Sevigny reports.